The prime concern of Icebreaker as a company is their relationship with nature. Since 1995 Icebreaker has been developing functional underwear and clothing made from pure merino wool, which is completely natural fiber and combines various positive qualities. Their product line provides a great alternative to synthetic garments, offering terrific next-to-skin comfort, natural breathability and odour neutrality. Apart from functional underwear and insulating garments, Icebreaker also provides fleece clothing made from 100% pure merino wool. By now the company is a global player and not only popular with outdoor enthusiasts. At the beginning of the 1990s, functional underwear and clothing made of crude oil based synthetic fibers were at the forefront of technology. These clothes had the advantage of being highly breathable, but there were also some nasty side effects. The textiles were quick-drying, but odors were very easily built up, which was very challenging on multi-day touring and expeditions, even for the most seasoned rope teams. As it happens so often in the outdoor world, Icebreaker was also a happy coincidence. Jeremy Moon, 24 years old at the time and fresh out of college was introduced to a merino sheep farmer by his girlfriend. He and his girlfriend hitchhiked out there and it turned out that the farmer had created a new kind of T-shirt using his merino wool. In the time that followed, the young company called Icebreaker that was led out of the founders bedroom at the time, was used trying to convince clients and investors to help out the company. The first loans from the bank were officially taken out for "new kitchens", and the first real profits started rolling in after three years, which were so impressive that they "drank up the success but still stayed sober". Their breakthrough came, when New Zealand born sailing star Sir Peter Blake wore two Icebreaker prototypes on his then record breaking 40 day and night uninterrupted world circumnavigation. With this free promotion, Jeremy really got down to business. Sales were built up from, as they say, out of the back of a car, and the first customers to ever buy and wear Icebreaker merino products were thrilled. They liked the idea of doing outdoor sports whilst wearing products on their skin that were not only all natural, but also had fantastic performance. The clothing proved itself to be perfectly functional in damp and cold, uncomfortable bivouac tents, on trekking tours through the New Zealand Alps, but also on summer hikes. It was warming, even when it was damp with sweat, but also did not form any unpleasant odors and was very comfortable on the skin. It took some time to establish this natural, sustainable functional fiber. Nowadays the company employs more than 350 people and still has its company headquarters in Wellington. 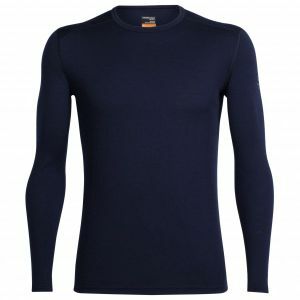 Icebreakers product lines have been constantly expanding and nowadays not only include classic merino underwear, but also outer layers of clothing, like socks and additional products. This means that you have very comfortable, breathable, waring and odor-resistant functional clothing on your body for practically every activity, all year round.